Generally, you can’t read PDF files on iPhone, iPad or iPod directly for the format isn’t supported by the devices unless you use third party application to help you. However, if you have iBooks installed in your IOS devices, no other applications needed, just follow the tutorial below, it tells you how to read PDF files on iPhone, iPod and iPad free. 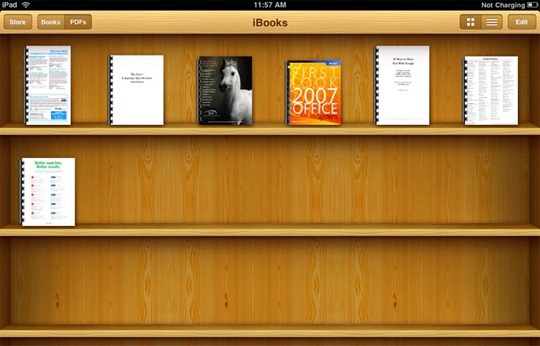 Step 1: Make sure you have installed iBooks in your IOS devices. If not, please download it and install it on your devices. Step 3: Indentify which PDF you would like to add. You can select more than one files at once or you can choose a folder one time. After indentifying, click “Choose”. Step 4: Now select Books from your iTunes Library. You can see the PDF files you just added is listed there. Step 7: Now select your iPad, iPod Touch or iPhone from the “Devices” list in iTunes. Select the “Books” tab from the list at the top. Make sure that “Sync Books” is checked. If you want to sync all of the books you’ve added to iTunes, select “All Books” and then click the Sync button. If you want to only sync specific books, choose “Selected Books” and then place a check next to each of the books you want to sync (and then click the “Sync” button). Step 8: Now open iBooks. You’ll see a PDFs button at the top. Tap it. Step 9: This is the last step. You’ll be presented with a list of all the PDFs you added via iTunes. Tap one of them. And it will open in iBooks. At any point in time you can tap the screen and a menu will appear at the top. From here you can change the displays brightness, search the PDF, bookmark a page etc. Isn’t it awesome! Now, just enjoy your PDF files in iPhone, iPod or iPad! Oh so ncie grea tso good spot!